Notes : Saw this recipe not long after I made the Lemon Bar Muddy Buddies and realized that we had some leftover lemon curd. 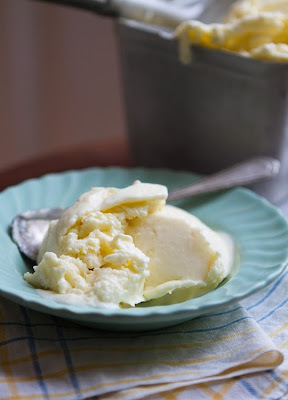 Brian loves to make ice cream so I forwarded along the recipe and he made it for us. He cut back on the sugar added and I'm glad he did. It was still on the sweet/sugary side from the lemon curd and didn't need sugar added. Review : OMG this is amazing. LOVED this ice cream. It was really rich and a little went a long way. Of all the ice creams Brian has made, this was one that disappeared quickly. To be rivaled only by his fresh cherry ice cream!